A set of Michelin XeoBib tractor tyres has clocked up more than 2,500 hours of demanding slurry work and the tyres still have two-thirds of their tread remaining. 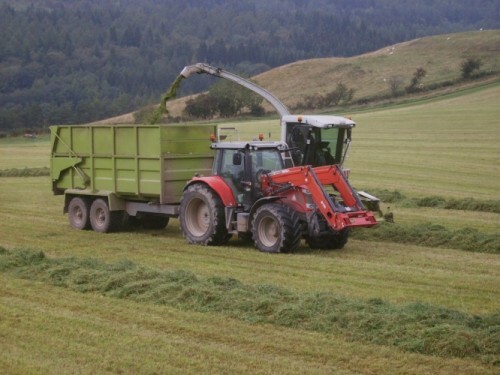 Paul Nixon, who runs Selkirk-based contracting company R&S Nixon & Co, fitted the tyres to his Massey Ferguson less than two years ago, and says the investment has more than paid off. Nixon says: “We’ve been delighted with how the tyres are wearing. We made the switch from using budget tyres and the difference in two years has been phenomenal. Reinforced sidewalls and special rubber compounds make the tyres – which feature Michelin’s patented Ultraflex Technology – extremely strong, even at low pressures, ensuring they last longer. Ultraflex Technology, which was launched 10 years ago, is renowned for enabling heavy farm machinery to operate with tyre pressures of less than one bar, helping to protect soil and enhancing crop yield. In the field, Michelin’s XeoBib tyres reduce soil compaction by distributing pressure over a larger surface area, which helps to avoid rut formation and soil compaction. The tyres are designed to offer enhanced traction on soft ground, meaning users like Nixon benefit from fuel and time savings in the field – as the tyres create less rolling resistance, which reduces wheel slippage, saving fuel and ensuring the job is completed quicker. Alongside the XeoBibs, Nixon also runs two trailers on Michelin’s CargoXBib tyres, which have continued to perform exceptionally over four seasons. Nixon replaced his trailer tyres with the Michelin fitments after a set of budget tyres wore out after only one season. For more information about the farm tyres available from Michelin visit www.michelin-agricultural-tyres.co.uk.